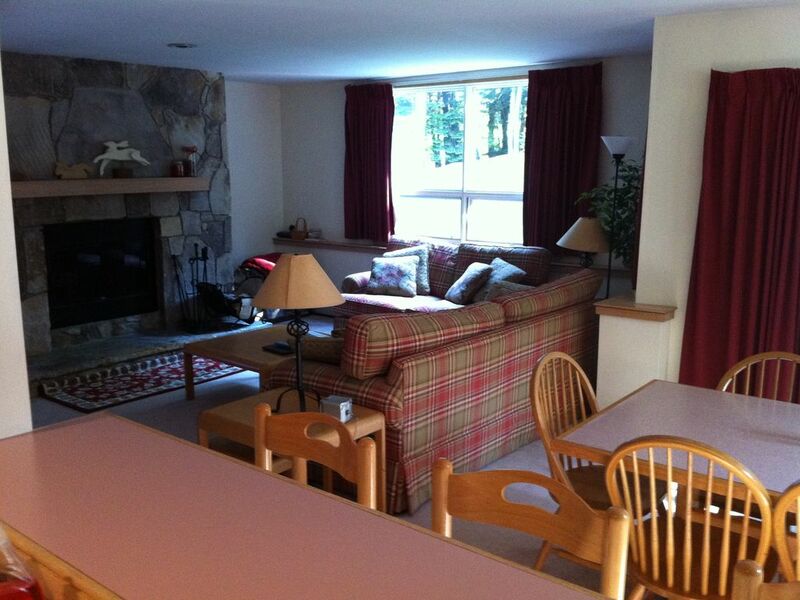 Ski-in/Ski Out Condo Located In Popular Seasons On Mount Snow. Nicely maintained 2 bedroom, 2 bathroom first floor end unit condo located in the popular Seasons on Mount Snow. Furnished to feel more like a home, instead of a typical rental condo. Convenient location right on the mountain allows for more enjoyment and less hassles. No more packing the car, driving to the mountain, finding a parking spot, hiking from the parking lot to the base area, finding a spot in the lodge, etc. Simply ski or walk right from the condo to the Seasons Pass ski trail, and then literally ski right to the back patio anytime. After your day on the slopes, relax by the fieldstone fireplace. Free firewood and kindling are provided. Or take the family to the Sportscenter and enjoy the indoor pool, hot-tubs, exercise room and games. Then enjoy a home cooked meal in the condo, or try one of the many great restaurants nearby. Bedding configuration is 1 king in master bedroom, 3 singles in 2nd bedroom, and a sleeper sofa. So the unit sleeps 7 comfortably. Bed and bath linens are provided. Overall a great place to call home during your visit to Mount Snow! Thanks for considering my property, and please contact me with any questions. I grew up near Burlington Vermont, spent a few years in Vail CO after college, and then moved back East to be closer to family. While I miss the Rockies, mother nature has surprised me a few times with champagne powder conditions similar to those out west. Mount Snow is the closest resort to my home in Spofford NH (about an hour's drive). Ski-in/ski-out convenience cannot be beat! place was as I expected and as the pictures show it. true ski in, and it would have been ski out if sundance ski lift was working. cozy living room, very nice dining table, nice kitchen with opening to dining room. One bath tub and one shower a plus. instructions short and clear. pillow cases needed changing, but other than that we had an enjoyable relaxing stay. Super easy check in/out. Clean unit with easy ski in/out. This is a great condo for a family ski vacation, as it’s in the perfect location in Seasons just below the Seasons Pass trail for easy ski-off access. The unit is very comfortable and clean and is well equipped with everything you could need. The indoor pool and hot tubs at the Sports Center provide a great way to end the day. And Carl is very responsive and accommodating. Overall a great experience. This is our second time staying in this condo and we’ll be back again. Condo was nice but needed a little help! The condo needs a little updating - the furniture in LR was very old. The shower in the second bathroom needed help as the door didn't close properly and water leaked on the floor. The weather could have been better but that's the chance you take when booking a ski vacation. The condo was well stocked with towels and supplies - everything you could need. Carl's place was perfect for a vacation at Snow. The place was well maintained, very well equipped , easy access to the ski trail and had a great personal touch to it. The hot tub and pool at the sports center were a nice finishing touch at the end of the day. At the end of your stay you think, ' I can't wait to come back and do it all over again!'. Thanks for a great winter vacation Carl! Please ask owner for recommendations on where to eat, shop, and explore.